The Hannover International Industrial Exhibition in Germany was founded in 1947 and is held every year. It has successfully held more than 70 sessions. The exhibition is not only the largest industrial exhibition in the world, but also exhibits high technical content. It is recognized as one of the most important platforms linking global industrial design, processing and manufacturing, technology application and international trade. As the world's largest industrial expo, HANNOVER MESSE (Hannover Messe) has gathered technologies in various industrial fields, leading the innovation and development of the world's industries, and has become a true “barometer of world industrial development”. In the course of its development, HANNOVER MESSE shows its adaptability to the trend, and has now developed into the flagship exhibition of global industrial trade and the most influential international industrial trade show! The exhibition area of the previous exhibition was 350,000 square meters, with a total of 6,500 exhibitors from all over the world. 58% of exhibitors are from countries other than Germany. The countries with the most exhibitors at this year's show are Germany, China, the United States, Italy, Turkey and the Netherlands. The number of viewers reached 225,000, of which 75,000 came from countries and regions outside Germany, and the number of viewers from the United States and China also hit a record high. 3, Electric Drive: General industrial motor, special industrial motor, servo motor, general-purpose small motor, special design small motor, frequency conversion, converter device and components, electric drive control system, electric drive governor, electromagnetic equipment, magnet, Electric motor components, etc. 7. R&D and technology categories: Shortcuts for innovation, space conversion, bionics, optical technology, technical textiles, organic electronics, applied research, basic science research and technology incubation, technology transfer, companies, research institutes, and universities and colleges Innovation results research, institutional and scientific research unit market docking. 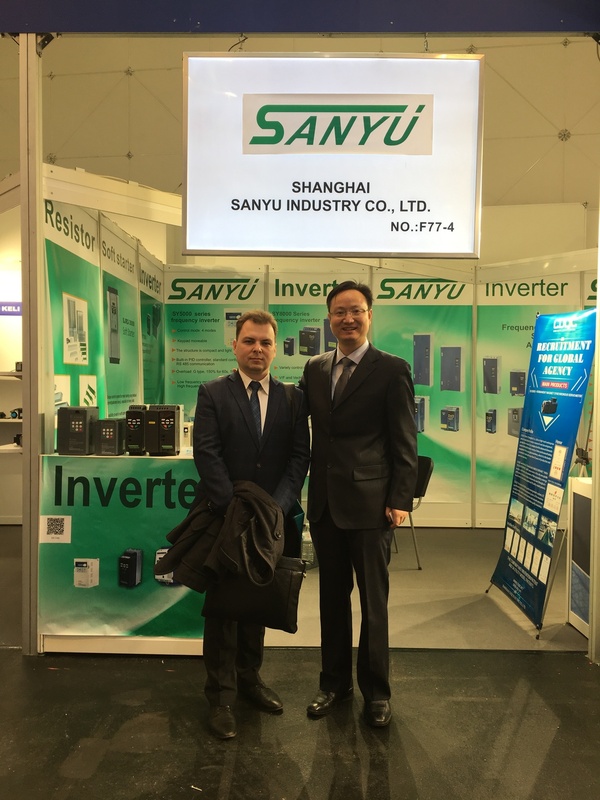 The Hannover exhibition in Germany not only deeply understood the European industrial market, but also promoted SANYU's brand promotion in the industrial automation industry, further enhancing SANYU's domestic brand image in the electronic equipment industry. In the future, SANYU will continue to rely on independent research and development to improve product performance and reliability, improve service quality, and provide customers with better products and more perfect system solutions.